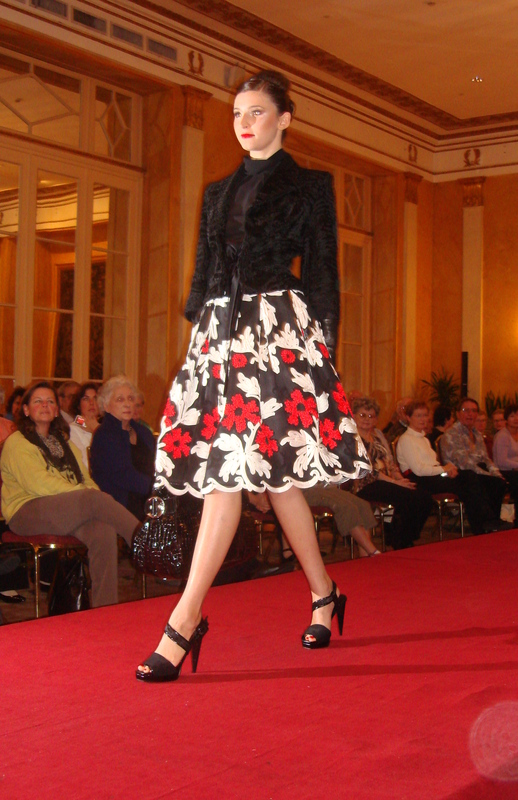 Red, black and white was in every one of the 33 elegant sophisticated creations. So when I saw them, chills came over my body. They were so beautiful and so refreshing to see in today’s society. All were custom designed by Michele Miglionico, an Haute Couture Italian designer in Rome. Being in attendance at my first High Fashion Show at the 85th Anniversary of Tauck World Discovery in Rome was a super high for this life-long seamstress. And I was on the front row in a prime seat location at the entrance to the runway so I could see them full view as they entered the room, as they walked the runway, and as they left the room. The six beautiful models were very tall and very thin and in a very perfect pencil-like shape. Oh, to be thin again. And their hair styles were all the same, in 3-4 big knots or rolls on the top, sides and back of their heads. The hair style was fitting for the occasion and allowed emphasis on the fashions. The shoes were all very high heels. The first model set the theme for the fashion show, black, white, and red for the colors and sophisticated tailored elegance for the style of garments made of silks, satins, brocades, linens and cottons. And every kind of sewing technique, from tucks to gathers to pleats was used. The styles ranged from casual, formal to professional attire. And every model after that was a different variation of this theme. Watching the models sashay while leaning backwards from the waist, swaying smoothly right then left down the runway with each foot landing right in front of the other one reminded me of the walk of a graceful elegant giraffe I had seen on a Tauck World Discovery tour in the Serengeti. By now, my head was spinning with excitement and I could barely get air because the magnitude of the fabulous fashion show in Rome just overcame me. The elegant style of the clothes reminded me of the style of clothes I used to design and sew. But, too soon, the show was over, and my dream had come to an end, and I didn’t want to leave. But then, Robin Tauck, of Tauck World Discovery, invited us to accompany her backstage to meet designer Michele Miglionico. I accepted immediately without hesitation and followed her to continue my fashion experience that hadn’t ended yet. Mr. Miglionico shook my hand and hugged me, offering a custom fitting for attending the show. And I could browse through the racks of clothes he had just shown us to find exactly the one I might want. Then Robin Tauck offered to take our photo and she put a huge purse in my hand that was used in the style show to complete the “balance” of the photo. Of course, we were standing right in front of a rack of the gorgeous fashions in the show. My private custom fashion show ended again and this time I had to leave. But as I left, I dreamed of days gone by when I also wore my beautiful custom-made and designed ensembles and was thin and pretty and could have been one of those on the runway.